Solar Water heating uses the sun’s rays to heat water, which is then transferred either directly or indirectly (depending on the system) to the water stored in the hot water cylinder.. Solar water heating systems normally have back-up heating incase there has not been enough sun. We can provide Gas Boiler, Electric Back up or Heatpump back up and these back up heatsources can also be used to fuel heating systems i.e. floor heating or radiator heating. 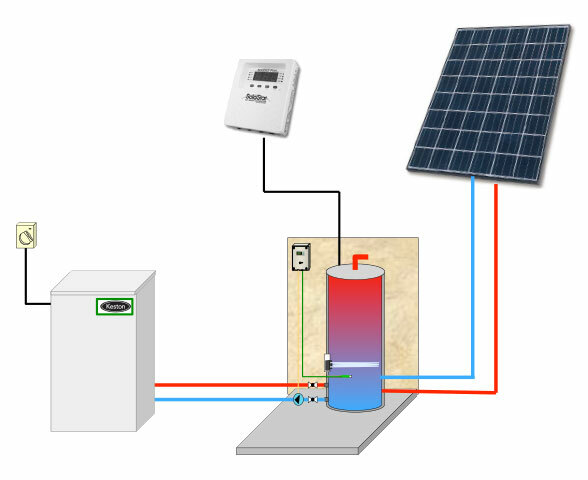 Our typical system is fitted with a circulating pump, differential solar-stat and two temperature probes. One probe is located on the top of the panel on the roof in the hot water outlet connection. The other probe is mounted on the suction side of the pump. When the differentail between the two probes is 12 degrees C, the pump is activated drawing cold water from the bottom of the cylinder pumping it up through the panel on the roof, and back down to the middle of the cylinder. Once the difference in the probes is reduced to 6 degrees C the pump turns off. The electric side becomes a “Back Up” to the solar operation during this period. A pump system is more efficient than a thermosyphon system comparing the same size panel and will allow for more flexible piping layout within the constraints. The higher water flow means, a higher heat transfer, thus more efficient overall heating.